Here is a short, personal account of our panel (27th March) at the iConference, held in Sheffield 26th-28th March 2018. Philosophy, in its concern with ontology, epistemology and ethics, is of fundamental relevance to library & information science (LIS). Our panel posited four provocations, from which to debate the value of Floridi’s philosphy of information (PI), as a foundational philosophy for LIS. LIS can be defined as the study of the processes of the information communication chain, and the interactions between them. I first wrote about the usefulness of the communication chain model as a framework for LIS in 2009, and over the ensuing decade, I have updated the processes to include those shown below. The processes and associated interactions are affected by changes in society: new technologies, contemporary politics, economics, and socio-cultural behaviour. There is a need for continual study of informational processes, so that we can anticipate and understand the consquences and impact of drivers for change on how information can be accessed and used to enable a fair and prosperous society to flourish. Within the field of LIS, we understand information as being instantiated as documents. Documents, assuming the widest possible definition, are the means by which LIS performs its stewardship of the record of humankind. Much of our world is now living hyperhistorically (Floridi, 2014, p4), where ICTs are not only required to record and transmit our transactions, but are essential for maintenance and further growth of society, welfare and wellbeing. A brief note on my own discovery of PI in 1999 and the process of deriving the PI literature within LIS through my Library Trends issues, with observations regarding an applied philosophy using the example of the philosophy of time/computation. A short reflection on the move to on-life as a once-only transition in the life of a civilisation (Floridi 2018), and the response of LIS. A brief note on the concept of “ontic trust” as it might expand LIS’s remit beyond our interests in information collection (well described by Richard Fyffe, 2015) and into the collective interests of the infosphere (well described by Massimo Durante, 2017). What is (Library &) Information Science? The first point of discussion revisited the well known debate surrounding the relationship of information science to library & information science, and the perceived lack of agreed definition for either. The question was whether such a lack of agreement meant it was difficult to debate the value of PI. A similar question raised the issue of if, and how, PI applied to archives and records management. Whilst the different approaches taken between UK/Europe and the US to information science are understood, I believe that the information communication chain model offers those of us who lean towards the documentation movement to explicate and define information science, an entirely suitable framework for linking not only library and information science, but all the information sciences, including archives and records management. All of the information sciences are concerned with the processes of information communication, which can be regarded as a spectrum of activities. Whether research and practice may be termed library science, information science, archival work or records managment, depends entirely upon from where within the communication chain the viewpoint arises. Library related activities focus on processes associated with collections and services; information science may focus on technological solutions to information retrieval, or analysis of data; whilst archival practice may focus on the authority, provenance and access for a given set of documents. All are encompassed by the categories comprising the information communication chain. In this case, there is no difficulty in considering the value and potential of PI to the collective disciplinary range. What Kind of Philosophy is the Philosophy of Information? A second point of discussion considered at which level Floridi’s philosophy of information was to be understood; as a branch of philosophy, PI, at the same level as epistemology, or as a philosophical position, pi, akin to realism, for example. The information lifecycle is readily recognised as a more fine-grained description of the processes of the information communication chain. It would follow therefore, that PI is of relevance to LIS as a first philosophy, which investigates the nature of information, to subsequently address the problems of information communication. The philosophy of information does not relate exclusively to LIS however, and PI should be understood to address the overarching nature of information and the information society. Whilst Floridi states that the task of PI is not to develop a unified theory of information, an examination of the ways in which the semantic information of LIS is understood in relation to the concepts held by different domains, is certainly of value, and in a small contribution to this wider remit, David Bawden and I have considered the ways in which different disciplines understand the concept of information, attempting to draw out unifying threads (Robinson and Bawden, 2013). For more work on information within different disciplines and domains, see also Floridi 2016). The third issue acknowledged that we were applying the philosophy of information to LIS retrospectively, and asked whether this was ever really possible or appropriate. Is it a requirement for underlying philosophies to exist before the discipline for which they provide the building blocks, or is it feasible to apply a philosophical foundation after the event, as a discipline develops? The outcome from the ensuing discussion was that it is acceptable, and often valuable to apply a philosophical position to a discipline retrospectively. Indeed this often happens in the case of recently emerged fields such as media studies, or new branches of medical science. The question of whether a given philosophical position is appropriate or valuable to a discipline still remains however. My provocation was to give a response from LIS as to whether Floridi’s philosophy of information has value for LIS. The short answer, I believe, is that is does, furnishing us with a more holistic foundation than those offered by alternative philosophical writings such as social epistemology or Popper’s three worlds (Bawden and Robinson, 2018). All disciplines require a philosophical foundation, although often such stances may be implicit rather than explicit in the literature. As LIS can be described as the study of information communication processes, a philosophical underpinning focused on information would seem desirable to provide the conceptual basis for our disciplinary activities. LIS has been connected with technologies of communication since written record keeping emerged around 5.500 BCE. It is agreed within the discipline that technological development is the most significant force driving activities within the LIS field. The contemporary significance of this is further described succinctly by Floridi, in drawing attention to the fact that we live in a unique time, as the more senior amonst us are what remains of the last generation which will have known a completely analogue world. (Floridi, 2018). With the move to our hybrid environment, incorporating Floridi’s concepts of the 4th revolution, the infosphere, hyperhistory and onlife, LIS transitions from stewardship of the physical record to stewardship of the infosphere. Floridi’s philosophy of information seems to be the most helpful foundation to date, in its alignment with and consideration of concepts relation to data, information, socio-technological and ethical concerns. LIS, regarded as the applied philosophy of information, aligns itself well with these concerns. At the risk of oversimplification, I offer the students a list of selected ideas from Floridi’s work which we can use to build our understanding of information, and the information society, and thus act as points of reference for the wider study of the nature of information. I would be grateful for any comments from which to further develop this answer – indeed it is likely to be of wider interest, not only to students, but also to practitioners and researchers. OVerall, the discussion and debate emphasised a need for more widespread agreement on the terminologies relating to philosophy, (branches of philosophy vs positions for example) and identified a gap for further work on the identification, description and examination of philosophical viewpoints as they relate to LIS. We also need a basic framework from which to critique philosophical literature as it relates to our discipline and practice. During the panel, in addition to Floridi’s philosophy of information, Egan and Shera’s social epistemology was mentioned, as was Popper’s three worlds and open society. All have affinity with LIS, but their applicability is not as well investigated and documented as might be, so that despite its critical role within our society, LIS fails to benefit fully from a firm conceptual and philosophical basis. The panel concluded with a show of hands, indicating a strong (25+ people) interest in further exploration of the distinctions and interrelationships between philosophies, paradigms and theories within, and as they relate to LIS – this is an area that is hard for students (and researchers) to comprehend, and one where there is little consensus of an agreed framework of understanding for the concepts themselves. As library & information science transitions from stewardship of the record to curation of the infosphere, we look forward to further exploration and understanding of the philosophy of information, to enable our committment to ensuring that the record of humankind persists. Floridi L (2011). The Philosophy of Information. Oxford. Floridi L (2014). The 4th Revolution: How the infosphere is reshaping human reality. Oxford. Florid L (Editor) (2016). The Routledge Handbook of Philosophy of Information. Routledge. Robinson L (2009). Information Science: the information chain and domain analysis. Journal of Documentation, Vol 65(4), 578-591. It must be the popularising effect of James Gleick’s new book “The Information”, because suddenly everyone I meet wants to talk about information: its history, its epistemology and Shannon-Weaver’s 1948 mathematical theory of communication (MTC), which became known as the mathematical theory of information. This is certainly good news for our information science course, where information has been considered from an academic perspective since 1961. I feel my time has come; all those hours spent memorizing equations to show that I truly, deeply understood how many signals you can push down a channel of a certain size, allowing for noise, have finally been rewarded, and I can now brandish my information-science credentials with a superior air of I told you so. Information is the new black, and everyone is wearing it. I believed that I would forget Shannon’s theory entirely, as soon as the exam was over. It did not seem so relevant to my work at the time, which was with information resources in toxicology. Life, however, with a patient smirk, ensured that the ashes of the MTC rose like a phoenix 20 years later, when I was faced with presenting the mathematical good news to contemporary LIS students taking our Library and Information Science Foundation module as part of their masters. I dusted off my 1986 copy of Robert Cole’s “Computer Communications”, my notes still there in the margins of page 10, where I left them. The issue I faced was one of presenting a definition of ‘information-science’, and of outlining its history as a discipline, to modern LIS students. Many of the papers considering the origins of information science gaze back in time to illuminate Shannon’s equations with a rosy pink glow, suggesting that his theory somehow led to the birth of information science as a true science (Shera 1968, Meadows 1987). This was the story in the 1980s, but in the 21st century, a more plausible thread is emphasized, the work of Kaiser, Otlet and Farradane on the indexing of documents, which suggests that the MTC was a bit of a red herring in respect to the history of information science. Rather then that information science grew out of a need to control scientific information, coupled with the feeling amongst scientists that this activity was somehow separate from either special-librarianship or the more continental term for dealing with the literature, documentation (see Gilchrist 2009, Vickery 2004, Webber 2003). Consequently, Shannon used the term information, even though his emphasis was on signalling. The interpretation of the MTC as a theory of information was thus somewhat coincidental, but this did not prevent it being embraced as a foundation of a true ‘information science’. Shannon himself suggested that there were likely to be many theories of information. More recently, contemporary authors such as Stonier (1992) and Floridi (2010), have reiterated that MTC is about data communication rather than meaningful information. Floridi’s definition of information as ‘meaningful data’ is more aligned to the field of information science as understood for our LIS related courses. Whilst we can still argue what is data and what is meaning, we can see that the MTC utilizes ‘information’ as a physical quantity more akin to the bit, rather than the meaningful information handled by library and information scientists. Nonetheless, the MTC is still relevant to today’s information science courses because it has a played a pivotal role in the subsequent definitions and theories about information per se. And it is rather hard to have information science without an understanding of ‘information’. Many papers have been written on theories of information, and on the relevance of such theories to information science (see, for example Cornelius 2002). “call the entire field of control and communication theory, whether in the machine or in the animal, by the name Cybernetics”. The relationship of information to statistical probability (the amount of information being a statistical probability) meant that information in Shannon and Wiener’s sense related readily to entropy (anecdotally von Neumann is said to have suggested to Shannon that he use the term entropy, as it was already in use within the field of thermodynamics, but not widely understood). The link between information and entropy had been around for some time. In 1929, Szilard wrote about Maxwell’s demon, which could sort out the faster molecules from the slower ones in a chamber of gas. Szilard concluded that the demon had information about the molecules of gas, and was converting information into a form of negative entropy. Brillouin’s outcome was that information is associated with order or organization, and that as one system becomes organized, (entropy decrease), another system must becomes more disorganized (entropy increase). The correlation between the measurement of entropy and information did however, lead to the separate field of information-physics, where information is considered to be a fundamental, measurable property of the universe, similar to energy (Stonier 1990). This field stimulates much debate, and is currently enjoying what passes for popularity in science. A recent article in New Scientist tells how Shannon’s entropy provides a reliable indicator of the unpredictability of information, and of thus of uncertainty, and how this has been related to the quantum world and Heisenberg’s uncertainty principle. Ananthaswamy (2011). In the same book, Schrödinger outline the way in which genetic information might be stored, although the molecular structure of DNA was not published until 1953, by Crick and Watson (see Crick 1988). The genetic information coded in the nucleotides of the DNA is transcribed by messenger RNA and used to synthesize proteins. Information contained in genetic sequences also plays a role in the inheritance of phenotypes, so that informational approaches have been made within the study of biology (see Floridi 2010, also for discussion of neural information). For the purposes of our library and information science courses here at City University, we consider information as that which is ‘recorded for the purposes of meaningful, human communication’. Although I personally find Floridi’s definition helpful, information in our model is open to definition and interpretation, and is often used interchangeably with the term ‘knowledge’. In either case we regard the information as being instantiated within a ‘document’. The term ‘document’ also does not demand a definitive explanation, it merely needs to be understood as the focus of ‘information science’, its practitioners and researchers. The chain represents the flow of recorded information, instantiated as documents, from the original author or creator, to the user. The understanding and development of the activities within the communication chain is what library and information specialists do in both practice and research. As a point of explanation, I take organisation in the model to include the working of actual organisations such as libraries and institutions, information management and policy, and information law. Information organisation per se, fits within the indexing and retrieval category. Our subject is thus a very broad area of study, one which is perhaps better referred to as the information sciences. The question of how we study the activities of the model can be answered by applying Hjorland’s underlying theory for information science, domain analysis (Hjorland 2002). The domain analytic paradigm describes the competencies of information specialists, such as knowledge organization, bibliometrics, epistemology and user studies. The competencies or aspects distinguish what is unique about the information specialist, in contrast to the subject specialist. Further, domain analysis can be seen as the bridge between academic theory and vocational practice; each competency of domain analysis can be approached from either the point of view of research or of practice. There are many definitions of information science, and there are other associated theories or meta-theories. The latter of which may also be associated with a philosophical stance. Nonetheless, the model portrayed above has proved to be a robust foundation for teaching and research, yet it is flexible enough to accommodate diverse opinions and debate as to what is meant by ‘information’. It allows for diverse theories of information. It is interesting to reflect on whether ‘information’ as understood for the purposes of library and information science has any connection with ‘information’ as understood by physics and/or biology, or whether it is a standalone concept. 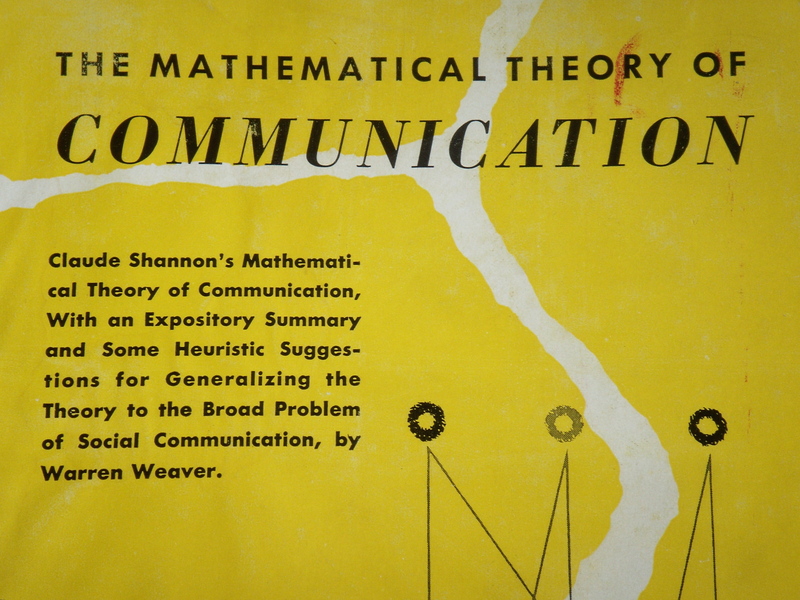 Indeed later authors such as Bateson (1972) have suggested that if information is inversely related to probability, as Shannon says, then it is also related to meaning, as meaning is a way of reducing complexity. Cornelius (2002) reviews the literature attempting to elucidate a theory of information for information science (see also Zunde 1981, Meadow and Yuan 1997). I agree with him. I do not think we can have information science without a consideration of what we mean by information – but information is a complex concept, and one that can be interpreted in several ways, according to the discipline doing the interpretation, and then again within any given discipline per se. It is not an easy subject to study, despite its sudden popularity. The literature of information theory is extensive, and scary maths can be found in most of it. Nonetheless, it is essential for anyone within our profession to have in mind an understanding of what we are working with; otherwise it is impossible to justify what we are doing, and we appear non-descript. Understanding information is like wearing black. Any colour will do, but black makes you look so much taller and slimmer.